In the pantheon of greatly anticipated exhibition games, oxymoron that it is, Saturday’s in the Indianapolis basketball temple ranks among the most significant, a great welcome back for one of the NBA’s basketball gods. Or at least most everyone still hopes. But this bit of sangfroid at this time perhaps defines Rose best as the basketball world wonders just what they’ll see in Rose after the longest injury absence ever for a former league Most Valuable Player. Rose has not played against NBA competition in a game, even an exhibition, since his catastrophic knee injury in the opening playoff game to conclude the 2011-12 season. He missed all of last season amidst doubt among some in the community of his motives and readiness. But he remained stoic and committed. And now he says he’s ready. Well, at least more than generally attend an NBA exhibition game, the most ever media credentials issued, a Pacers’ spokesman said, for a Pacers’ preseason game. Will he be the Derrick Rose everyone remembers? This not being the NFL preseason when the Bulls Saturday face the Indiana Pacers, the starters generally play six to eight minutes in the first and third quarters. Bulls coach Tom Thibodeau indicated there were no restrictions on Rose and no reason to hold back. Even as some still will be holding their breath. But you can tell from listening to Rose this last week as he’s been presented with every version of the question of how he feels about returning, Rose is much more in the “What’s the big deal” mode. That he’s a basketball player. And this is what he does. “It’s going to be exciting,” said Rose, whose demeanor belies the articulation. “At the same time, just take it like a regular season game and just try to go out there and win. For us, it’s time to tie things up, get our offense going and move the ball. I prepared myself. So I’m not worried. If I were just BS-ing around, I’d be scared. Right now, I feel I’m prepared and I haven’t missed a step. I can’t get caught up in (the media attention). I know my team and my coaching staff is behind me. If you ask anyone, I think I look the same. If anything, my confidence changed (because) I’m knocking down my outside shot now. Indianapolis, of course, was the site of the first game in Michael Jordan’s return after his first retirement, a national phenomenon event in which hundreds of media members attended, many without seats just asking to be in the building to say they were there. The Bulls have had bigger crowds at preseason games, more than 30,000 in the Superdome in New Orleans for Michael Jordan and the Bulls after the first championship. There were big curiosity preseason games in 1995 when Dennis Rodman was added to the circus. It wasn’t as big in Jordan’s first preseason game in 1984 as the words of general manager Rod Thorn that it wasn’t like Jordan could turn around a franchise hung over fans. There was excitement in 1975 when the Bulls went into the preseason with Nate Thurmond, their first true center whom they believed would lead them to a title. But that was then, when the NBA wasn’t such an attraction. Few preseason/exhibition games match what is ahead for Saturday, though not on a substantive level. Essentially, everyone wants to see if Rose can run without falling down. We know he can. His teammates and coaches know he can. His doctors and trainers know he can. He’s been doing so for months. We’ve seen him dunk in pregame workouts at the United Center last spring. So it’s not like anything substantial is going to happen. For the Bulls as a team, it’s more that they want to get this over as well. It’s reminiscent of the early Jordan years and the Rodman revue when teammates spent most of their interviews being asked about someone else. Not that anyone resents Rose. He’s way too loveable. But the Bulls also want to get to the basketball as they believe they have a pretty good chance this season, and the Pacers are the team along with Miami picked as their biggest rival or obstacle. “I want them to compete,” said Thibodeau. “It’s a competition. Once you commit to putting everything you have into each day, you should play as hard as you can. You want your team to play as hard as it can. You may not play the same number of minutes (in preseason games). But the only way you can prepare yourself for an NBA season is by doing that. The serious minded players condition themselves year round to play with the type of intensity that’s necessary to be successful. But the Bulls won’t have quite their full boat to row. Joakim Noah will sit out, he said more as a precaution, with a tweak of his groin he sustained earlier in the week and aggravated Friday. Noah said he’ll miss the first few preseason games. Taj Gibson likely will get more time at center as a result. Kirk Hinrich missed some practice earlier this week with back spasms, though he said he’s recovered and will play Saturday. Thibodeau also said he’ll use preseason, as he has in practices, to test out different playing combinations, which won’t necessarily mean he’ll use them in the regular season. Plus, Thibodeau indicated he’ll want to see some of the free agents trying to earn that last roster spot and the rookies, though we assume we don’t see much of them once the season begins. But at least this first one is all about Rose. Perhaps more games will be as who knows how many months and falls it will take before fans are persuaded Rose is as he was before and faces no more danger than anyone hurling himself 10 feet into the air against 275-pound men. Hmmm, that didn’t come out exactly how it was meant to. But Rose knows the risks as much as anyone, and I do believe he isn’t worried. Not only because he’s prepared himself for months, but this has been another step in his maturation as a basketball player and a man. Rose turned 25 Friday, and he said the two Bulls rookies in the NBA’s relatively mild hazing had to sing him happy birthday. He said it wasn’t very good and they may have to try again. Rose has reiterated that point for some time now, that the injury was more in the line of things happening for a purpose. It also is what strengthens him. He’s a young man of faith, but also of purpose. It’s perhaps why the mental hurdle was not so large to him. Rose seemed to just feel it was his time, and then it was his time to work and now that’s all in the past. Everyone basically hopes so. Still, they want to see for themselves. Indianapolis rarely is confused with Lourdes, but it has become the place to begin the healing process for Bulls stars. 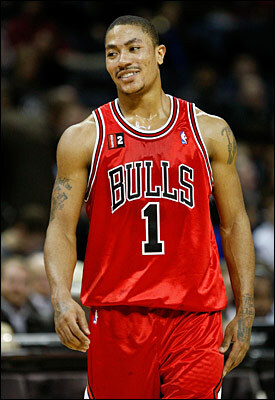 And then typical of Rose, he said it will be his job to adjust to his teammates. Not them to him. Rose said he has no expectations for playing time. Just whatever Thibodeau wants. And no specific plan other than being the same ‘ol Derrick Rose. There’ll be some changes, though Rose insists not in how he approaches the game. He has talked about his extended shooting range, so he’ll probably try several threes. He’s talked during camp about how everyone has to take his open shots. Noah also talked about how Thibodeau changed the offense some with more read and react, though you’d figure the Bulls still to be a pick and roll team. Noah said he did work on a lot in the summer, but, no, he’s not a post up threat quite yet. Noah was disappointed he won’t be able to start the season, though he insisted his groin problem is no red flag of more injuries. He said he would be playing if it were regular season. But better to wait for now. Noah was wearing adidas sneakers. There’d been questions about the French brand, Le Coq Sportif, he’d been wearing with his frequent foot problems. Noah said he’d probably be switching to adidas, which Rose endorses, though nothing has been decided or finalized yet. “I’m all right,” Noah said. “I hurt myself a little bit a couple of practices ago. My groin a little bit. Just trying to be smart. I probably won’t play for a couple of preseason games. Unfortunately, I want to be out there real bad. We’re going to be smart and I’ll be ready when it counts. We know there’s a long way to go. Maybe it’s not MJ ’95, but everyone wants to take a look. After all, no one’s really seen this since April 2012. And it’s something you miss.